Sharp has come up with another sneaky way of smuggling a complete home cinema system into the living room; build a TV stand with a DVD player, multichannel amplifier and surround speakers inside. The electronics of the Sharp AN-PR11500H ﬁts ﬂush with the front of the stand, so you just see the slot and display, ﬂanked by the two driver arrays. – and where better to locate your kit than right underneath the screen? A short run of HDMI cable (included) is all that's required to get going, and the hefty structure provides the perfect place to conceal two subwoofers. And you are still left with enough shelf space to put your set-top box and games console. It's a pity the stand itself is a rather clumsy, angular design (it looks like it belongs in a pub) because it feels very sturdy and well put together. The two subwoofers are on hinges attached to the tabletop, so while it seems like a hellish self-assembly job from the box, you don't actually need a screwdriver at all. It's simply a case of unfolding the legs and popping the shelves in place. The MDF panelling is painted black, as are the grills for the speakers. The electronics and glass surfaces are all glossy black, too, so the whole thing sort of disappears in dark room. The long and narrow shape will suit any screen size up to around 60in very comfortably. 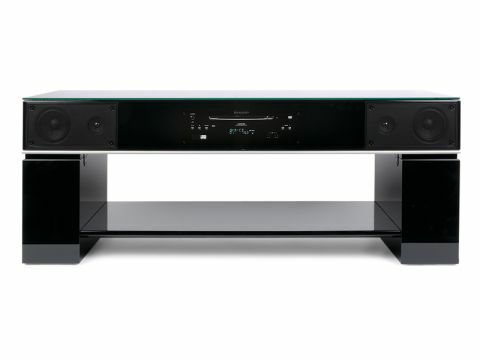 Besides the DVD player, the Sharp table system also conceals a USB port for accessing picture, sound and video ﬁles and digital audio inputs at the rear for connecting whatever components you put on the shelf. Surprisingly, given all the spare room inside the stand, there's no accommodation for an iPod, but you do get two mic inputs for karaoke. an issue as few rival systems do a particularly good job of boosting the picture up to 1080p, anyway. crowded with buttons. Amazingly, there's even a shift button to double-up functions. At least setting up the sound is a no-brainer, with all the speakers already accommodated and ready to go. Being built into a big, heavy cabinet is an added advantage too, reinforcing the bass from the twin subwoofers and the four front-ﬁring drive units. The result is satisfyingly full and resonant with a reasonable amount of treble detail and plenty of room-ﬁlling bass. The trouble is, it doesn't project well and speakers sound best when the tweeters are on ear level. So unless you're lying on the floor, you're not in the sweet spot. In short, this solution is a nice idea, but it's flawed by poor design and limiting speakers.